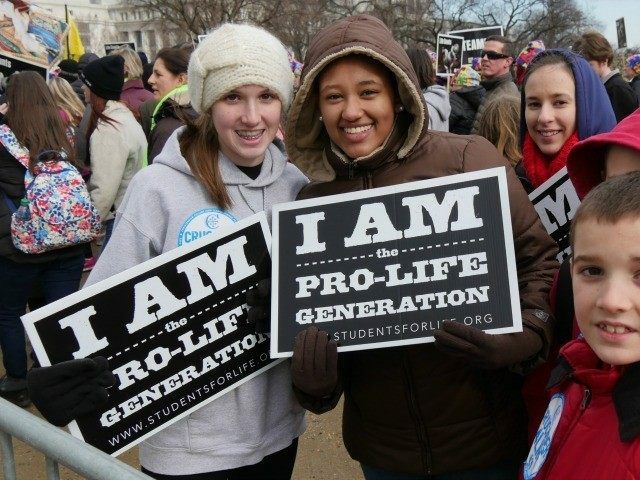 One of the most frequently heard observations about the annual March for Life, to take place again this Friday in Washington, D.C., is that it consists mostly of young people. And this gives hope to those who are part of this movement. But the cause for that hope is deeper than it first seems. The involvement of so many young people is encouraging not just because they are the future and will carry forth the cause into the culture, into their families, into the voting booth, and into the legislatures and courts. It is encouraging also because of the reason why they are involved. If you ask them why they’ve joined the pro-life fight, they will tell you: “Because I know it could have been me!” They realize, in other words, that when they were an unborn child, they were not protected by the law. They were considered “non-persons” and could have been legally killed. For these young people, legal abortion is not only a tragedy; it is a personal insult, an affront to the dignity of their personhood, which they possess today and which they know they possessed while in the womb. In speaking up for the babies, they are speaking up for themselves! This is an awareness and motivation that abortion advocates can do nothing to stop. And as a result, our pro-life movement receives a new strength and motivation each day from survivors. Psychiatrists have studied this phenomenon, and have actually identified ten different types of “abortion survivors,” and the symptoms that they carry, known as “abortion survivor syndrome.” Being an abortion survivor is a motivation to fight abortion and is also a deep wound. These dynamics are critically important for parents, educators, youth ministers and clergy to understand. Since I am a child psychiatrist, I talk to children. And it soon comes to my attention in interviewing children that they begin to suspect or frankly they know that one of their siblings was aborted. So what is it like now to grow up in a home where you suspect or you know that one of your little unborn siblings was aborted? It creates a whole range of very, very deep conflicts. And we now call that post-abortion survivor syndrome. They have in common many of the conflicts that were found in those people who survived the Holocaust. For instance they have survivor guilt. They feel it is not right for them to be alive. And they wonder why they should be selected when their little siblings were selected to die … which is precisely what happened to the people from the Holocaust. Why were they selected to live and some of their friends, relatives, and family were selected to die? And it leaves this deep sense of guilt. And that is a difficult, difficult thing to treat, because it is so deeply embedded. And of course with that is how can you trust your parents? Are they capable of killing you too? They killed one of your little siblings. And then it comes down to one of the deepest fears of all children, which is my parents might kill and eat me. And of course you see that in children’s stories like Hansel and Gretel, the wicked witch is going to put them in the oven. In various cultures, in various parts of the world all have deeply embedded this very deep fear that children have that their parents might kill and eat them. And of course abortion comes very close to that. And so it creates an enormous distrust of your parents. And if you can’t trust your parents then it is likely that you are not going to trust parent-like figures: teachers and everybody… priests. How can you people like that who take life, innocent life, or don’t protect it as much as they should? So in any case there is this wide range of signs and symptoms from a deep conflict engendered by the facts that they are survivors, survivors of abortions. Statistical survivors. These are people who survived in countries or cities where there is a statistically high probability that they would have been aborted. They come to know that the odds were definitely stacked against them. Sibling survivors. These are people born into families where one or more of their siblings were aborted. Disabled survivors. These are people who, because of developmental defects or other circumstances, would usually be aborted. In fact, they often wonder whether their parents would have aborted them had they known about the defects. Chance survivors. These are children who would have been aborted if the mother had been able to obtain the abortion. The abortion was prevented by a lack of money, time, permission, availability, etc. Ambivalent survivors. These are children of parents who could not make up their minds about the abortion and delayed until it was too late. They are often caught up in their parents’ continuing ambivalence, and can wonder whether they can still be terminated. Twin survivors. These are people whose twin was aborted. Twins communicate, touch, and even caress each other in the womb. The loss of the twin by abortion is deeply felt and often causes the survivor to be suicidal. Attempted Murder survivors. These are people who survived an actual abortion attempt. Besides the physical harm that is often done, they suffer intense psychological struggles, nightmares, confused identities, and a fear of doctors. Murdered survivors. These are children who survived an abortion for just a short period of time, and were subsequently killed by the abortion staff or left to die. So as we see the countless young people march for life this week, let’s pray for their healing, and let’s strive to understand them better as they engage in a very personal crusade.